Scientists say they have figured out the recipe for a rare fire tornado that raged during this summer's deadly Carr Fire in Northern California. A rare fire tornado that raged during this summer's deadly Carr Fire in Northern California was created by a combination of scorching weather, erratic winds and an ice-topped cloud that towered kilometres into the atmosphere, according to a study. 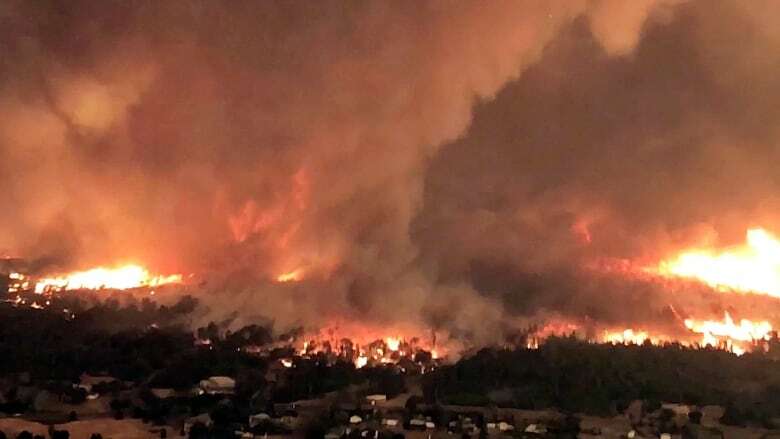 The churning funnel of smoke and flame killed a firefighter as it exploded in what already was a vast and devastating wildfire in July on the edge of Redding, about 400 kilometres north of San Francisco. The study released Wednesday in the Geophysical Research Letters journal used satellite and radar data to suggest how a monstrous "firenado" the size of three football fields developed on July 26. It said the firenado was formed in much the same way as a regular tornado, which differs from the "fire whirls" formed only by heat from a wildfire. The only other documented case of such a firenado was during the 2003 Canberra fires in Australia, according to the study. A key factor was the development of a cloud generated by the fire itself that was ice-topped and grew quickly, doubling in length in just 15 minutes. It reached as high as 11.9 kilometres (39,000 feet or 7.4 miles), according to the study, which was published on Nov. 21. The development of that pyrocumulonimbus cloud "helped stretch the underlying column of air, concentrating the rotation near the surface" and causing tornado-strength winds that reached 230 km/h, according to the study. "These observations may help forecasters and scientists identify — and potentially warn — for future destructive fire-generated vortices," according to the study. Lareau is an assistant professor in the Physics Department of the College of Science. The article was co-authored by Nicholas Nausler of the Storm Prediction Center in Norman, Okla., and John Abatzoglou from the Department of Geography at the University of Idaho in Moscow, Idaho. The Carr Fire Vortex: A Case of Pyrotornadogenesis?